Are digital interactive textbooks and the means to create them finally here? Amazon's Kindle, Barnes and Noble's Nook, and even Apple's iBooks have been working on moving us away from reading physical books and embracing the digital revolution. But until now, there was very little to convince us how good an idea this could be, since the digital versions looked very much like their real-world counterparts, right down to the page turning effect. You'd save a lot of weight if you tended to carry a few books with you, but no title appeared to offer the limitless potential of a true digital book, something more akin to what you can achieve with apps, for instance. All this and more is what Apple is trying to accomplish with its new content creation app, iBooks Author. Its aim is to revolutionise modern textbooks by bringing interactivity to the learning experience. Not only can you add images to your pages, the reader can zoom in or out of them. You can insert Keynote slides or movies that can either be viewed embedded inside a page or full-screen. There's even the possibility of creating short quizzes to test your reader's knowledge retention. You'd think that all this would require a lot of programming knowledge, but that's the beauty of iBooks Author: it's incredibly simple to use, and if you're familiar with Apple's iWork suite, you'll feel right at home within its interface. It's a bit like a cross between the iWork apps Pages and Keynote, but you can't change the page format in any way: it's designed solely to be used on an iPad – even iPhones and iPod touches are left out. Just like other iWork programs, you start with a choice of template, six of which are offered by default, although you can create your own if you so choose. You can write straight into iBooks Author, but it's also easy to import content from a Pages or Word document. Text is brought in seamlessly, but more complex formatting and embedded images can cause problems with the layout. 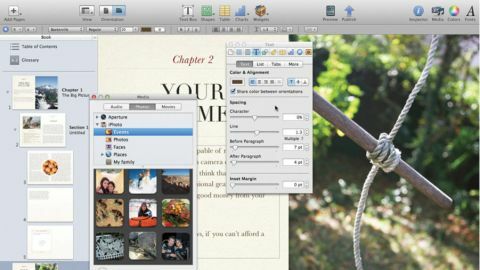 The best option is to bring in the text then add the multimedia in iBooks Author. Inserting media is child's play: you have a Media window from which you can locate photos, movies and music already stored on your Mac. Applying interactivity is done with the use of one of seven widgets, including being able to insert HTML dashcode applets, like those used to create Dashboard widgets on your Mac. You can also preview your work as you design it: connect an iPad to your Mac, click the Toolbar's Preview icon and your book will be transferred across the USB cable for you to check. A purple 'Proof' banner will appear on the cover of your ebook and you'll be able to browse through it and interact with your widgets to make sure they all work as expected. Once you're happy with the results, you can export your work in the iBooks format (or as a PDF or text file, but you'll obviously lose all the interactivity). That iBook can then be transferred to any iPad. It's a fantastic means of creating your own interactive documents and could do wonders in the classroom. If you'd rather profit from your endeavour, you'll need to respect the program's licence agreement which states that you have to make your iBook available exclusively on the iBook Store (the content remains yours of course, so you're free to redesign your book using a different program and sell it elsewhere). You'll need to acquire an ISBN number (an industry-standard code designed to catalogue all publications), and if you're not a US resident, you'll also need a unique reference number from the IRS. However, free books can be made available anywhere without such restrictions. Despite all the things this app allows you to do, and how it will empower teachers and even home-schoolers to design their own textbooks, it's a 1.0 product, which means it's a little rough around the edges at times. Aside from the occasional glitches that prevent you from altering the content in any way (a quick restart of the app solves that problem – thank goodness for Lion's Autosave feature!) there are some odd inconsistencies. For instance, the whole interface is designed around text boxes. You can link them so that your words flow seamlessly from one box to the other. However, in order for that to work, new linkable text boxes must be created with the help of a text box already present on your page. Text Boxes created from scratch by clicking on the relevant toolbar icon can't be linked to others. Worse still is iBooks Author's draconian restrictions when it comes to video formats. Only H.264 files are tolerated, but not all H.264 files are created equal. Try dragging a video clip you shot on your iPhone, iPod touch or iPad and it'll be rejected, even though we all know Apple's iOS products save their footage in H.264. If you export an iMovie project on your Mac, it's the same problem (you have to use the Share command to create a kosher version). What's worse is that files made with HandBrake, a video format conversion tool, or created with the excellent screen capture program ScreenFlow, won't work either – even though you can play back these files directly on your iPad, iBook Author refuses to. To make them work, you must open them up in QuickTime X and export them for the iPad. It seems like an unnecessary and unintuitive step to have to take. This run-around is far from what we're used to from Apple. But despite these problems, iBooks Author is an amazing program which enables anyone to create a polished interactive ebook in little time. If you can live with the licence agreement, you can have a lot of fun engaging with your students or customers. As long as they all own iPads, of course.